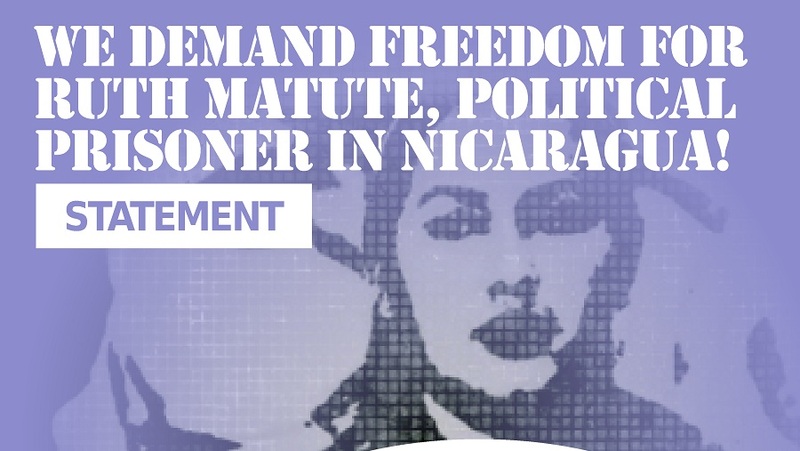 STATEMENT / We demand freedom for Ruth Matute, political prisoner in Nicaragua! Ruth Matute has been a political prisoner in Nicaragua since October 2018. She is recuperating from an operation due to a severe heart condition and her life is in danger. Mesoamerica, January 31st, 2019 – We, the 179 undersigned organizations demand that the Nicaraguan government immediately free Ruth Matute, who has been held in preventive detention since last October. She was arbitrarily arrested and accused of crimes of terrorism after taking food to family members who were being held in the Masaya police station. Having experienced heart failure, Ruth Matute must use a pacemaker. Last January 4th, her health took a turn for the worse and she had to be taken to the hospital, where she underwent emergency surgery to change the pacemaker. Even though, she is still recovering from the operation and is in a delicate state of health, we fear for her life. The criminal justice institutions of the Nicaraguan government refuse to suspend her confinement in preventive detention and allow her to go free. This act of negation by the government violates the human rights of Ruth Matute and may well constitute a case of both torture and cruel and inhumane treatment. Consequently, we call on the Nicaraguan government to immediately release Ruth Matute and guarantee her life and full health. We also ask to all rapporteurs and human rights bodies of the United Nations, as well as the Inter-American Commission on Human Rights, to take action and urge the Nicaraguan government to comply with its obligations to guarantee the human rights of Ruth Matute. Alianza de Mujeres Atravesadas por el Racismo AMAR Kolektiba Feminista. Asociación de Mujeres para la integración de la familia en Nicaragua AMIFANIC. Colectivo de mujeres 8 de marzo. Consorcio Para el Diálogo Parlamentario y Equidad, Oaxaca A.C.
Sí hay mujeres en Durango A.C.